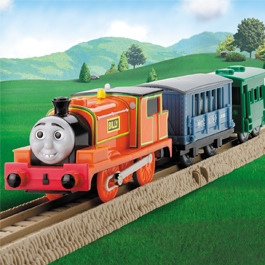 When Billy first arrived on the railway, Thomas was asked by The Fat Controller to show Billy around. But Billy misconstrued Thomas' advice for bossiness and so refused to listen to him, causing Billy to fail to complete his deliveries. At last, Thomas lost patience and told Billy to do his own thing. Billy was delighted, but his happiness was short-lived as he swiftly ran out of coal and water. In future, Billy paid attention to advice and worked hard with every job he did.